This sample uses the Love? Background Stamp, an image from the Couple's Mini Collage Sheet, victorian scrap flowers, and letter charms. 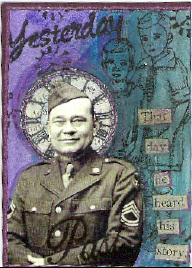 This sample uses the Time Background Stamp, and an image from the Snapshots Collage Sheet. 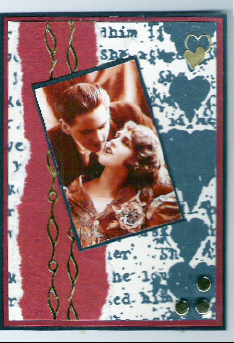 This sample takes an ATC and makes it the focal point of a greeting card. The Stylish Background matches the Time Background stamp. This greeting card uses the Daisy Kisses collage stamp and the matching Butterfly stamp. 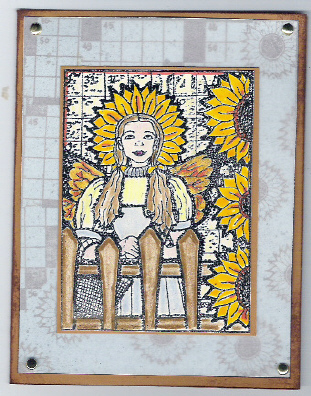 This greeting card uses the Garden Girl collage stamp, Sunflower, and Crossword Puzzle Background stamp. 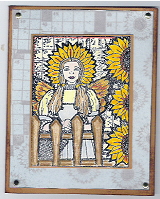 The Garden Girl image is colored with colored pencils and gel pens. 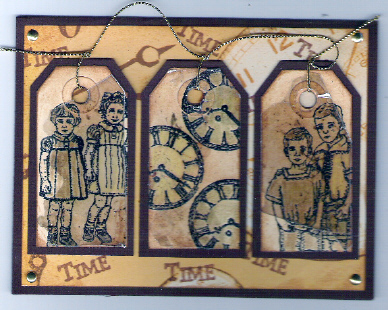 Mica tiles are trimmed to fit over part of the stamped images on the tags on this sample. 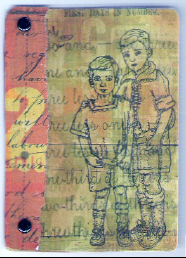 This ATC submitted by Heather Cockrell features the Brothers, Clock, and Yesterday stamps. 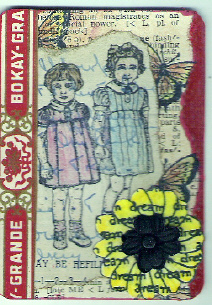 This ATC submitted by Heather Cockrell features the Sisters, Dream Flower, andButterfly stamp. A cigar trim label and vintage prescription receipt are also used. 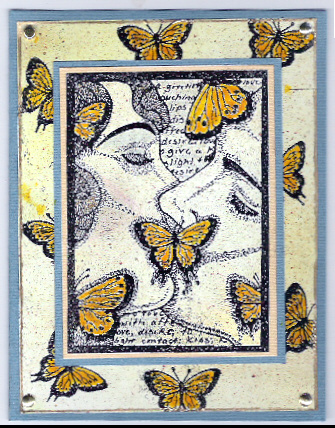 This ATC submitted by Heather Cockrell features the Butterfly Kisses stamp. 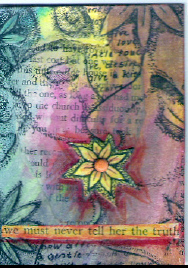 This ATC submitted by Heather Cockrell features the Daisy Kisses stamp. Submitted by Joyce Ryder. 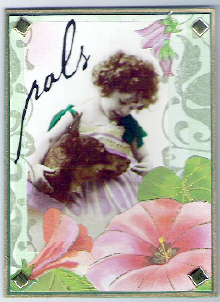 The Stylish Background Stamp and an image from the Little Ones collage sheet are used. Submitted by Joyce Ryder. 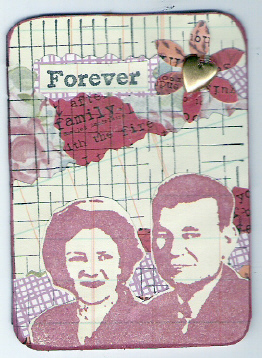 The Love?Background Stamp and an image from the Couples Minis collage sheet are used. 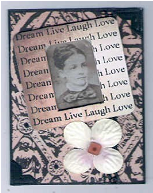 This ATC uses the Stylish Background stamp, an image from the Look at Me collage sheet, flower punch shapes and French text. 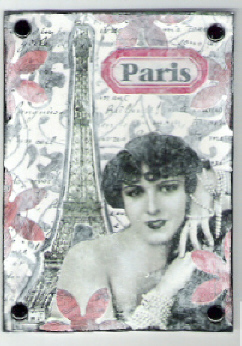 A gesso whitewash softens and ages this ATC. Three stamps from Sheet 4A are used for this ATC. 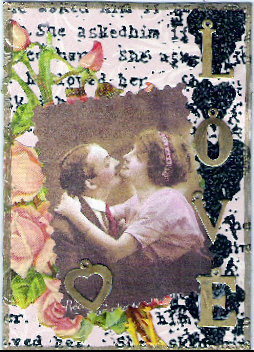 A flower punch and heart charm complete the ATC. 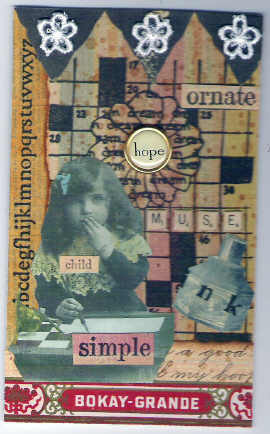 This collage submitted by Marcy Hudziak features the crossword puzzle background stamp, word stamps from plate 7, and letters from plate 6. 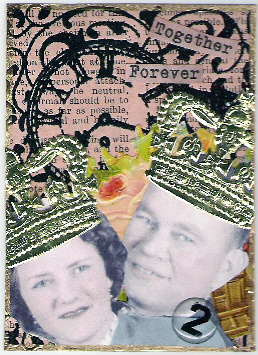 A cigar trim label finishes off this wonderful collage! 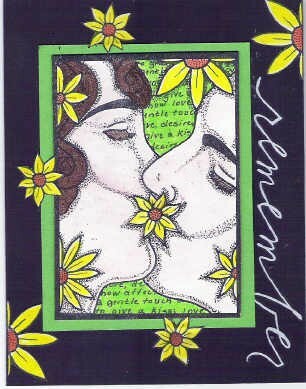 This greeting card submitted by Marcy Hudziak features the Daisy Kisses stamp! I love the bright colors! 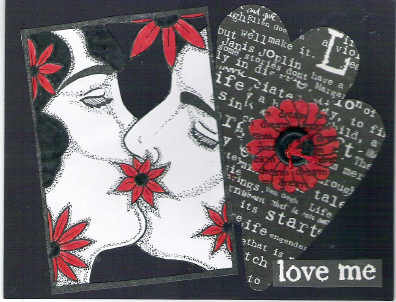 This greeting card submitted by Marcy Hudziak features the Daisy Kisses stamp and the dream flower stamp! 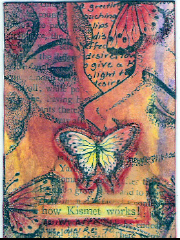 This ATC submitted by Marcy Hudziak features the Dream, Etc. stamp and the Ornate Relief Stamp! NEW NEW NEW!!! Bird Dictionary Rubber Stamp ATC sample! This sample was created by making a background of vintage sheet music and vintage maps. It was then sprayed with gold webbing. The birds were stamped with brown ink directly on the background. 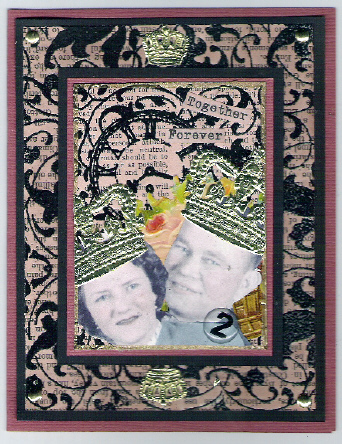 The other stamps were stamped on vellum and then attached.